I recorded this from TCM awhile back, and only watched it today. It is a 20 minute short starring two comedy mainstays of the silent era—Roscoe "Fatty" Arbuckle and Al St. John. It is full of the standard gags and physical comedy you expect with these two, and is pretty well-written. The title comes from a rather strange sequence in the middle where a swarm of animated bees attack Fatty as he is driving. The bees actually make only a short appearance, the main plot featuring a mixup involving Fatty's invention of a chemical to paint on china to make it unbreakable. (You have to see it to understand.) Luke the dog, often co-starring with Fatty, makes an appearance here as well, and is involved in the hijinks. The most interesting thing about this short to me was that this was the first time I had heard Roscoe and Al's voices. That was really odd, hearing them speak after seeing them in so many silents over the years, and their voices did not sound as I expected. I'm not sure what I expected them to sound like, but whatever it was, this wasn't it. 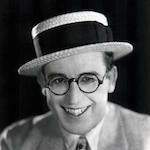 I think I remember having the same impression the first time I heard Harold Lloyd's voice. It's almost as if we subconsciously assume, perhaps, that silent stars such as these didn't have voices, so any sound coming out of them seems odd, even if it isn't that unusual on its own terms. All in all, an oddity, but worth 20 minutes of your time, if you're a fan of Arbuckle-style slapstick. Cool! Thanks for this review. I've never heard of it. I didn't even make the connection that this was in the soundies section until you started talking about voices. Very intriguing!! I didn't even make the connection that this was in the soundies section until you started talking about voices. I almost posted it in the silents section. With Arbuckle and Al St. John, you naturally think silents.